Last May when I bought my second bike I had a storage problem. My shed will only fit one motorcycle. I now had two bikes. I did not have the money, the time or the space to buy and build a bigger shed so another answer was needed. I could have opted for the cheapest option and just bought a simple plastic bike cover. But I already felt guilty enough turfing my trusty Zen out of his home. Yes cruel, evil meany me had bequeathed the shed to the new interloper. The Keeway RKS had been downgraded. Guaranteed not to rust. 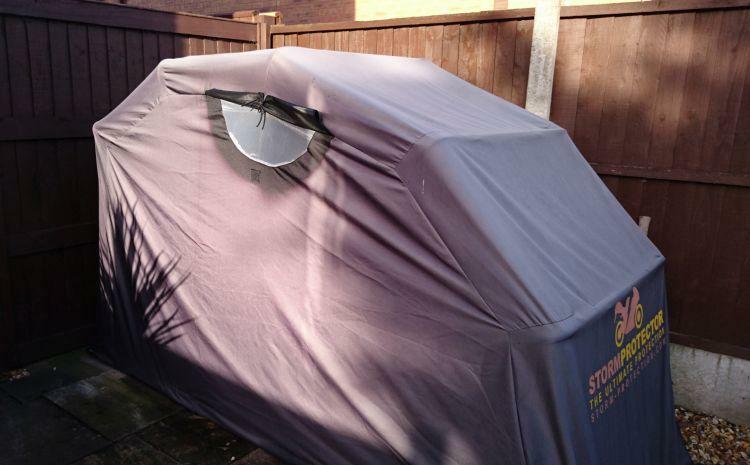 The StormProtector ® Motorcycle shelter is the only motorcycle shelter whose frame is made from quenched steel in the UK (steel that has super heated and cool quickly, to strength it) 80% stronger and 25% lighter than galvanised steel. 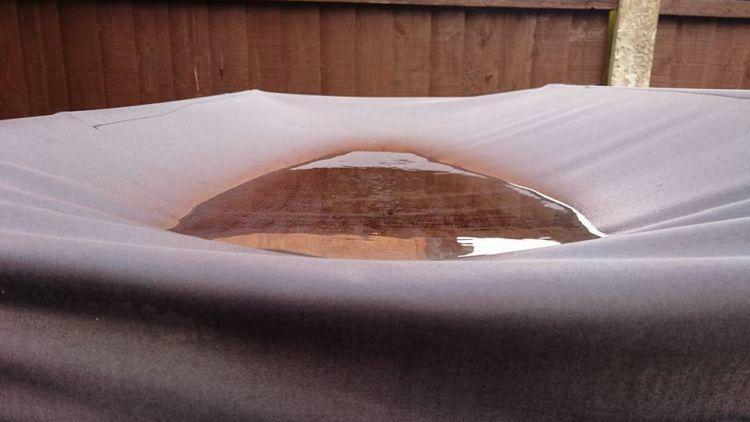 Anti sag roof design ensures water runs off the cover prevents water pooling. StormProtector® Motorcycle frame comes with a 1 year guarantee plus 2 year additional warranty if registered at quenchedSteelshelter@gmail.com within 30 days of purchase. Frame coated in Water Ripple powder coating which is super durable, prevents paint from cracking, has anti scratching properties, maximises the life of the quenched steel frame. Unique interlocking frame cover attachment, on front of frame, designed to withstand winds of 100mph and remain attached to the motorcycle frame. By increasing the area of the frame in contact with the cover and lowering the key wind resistance point. 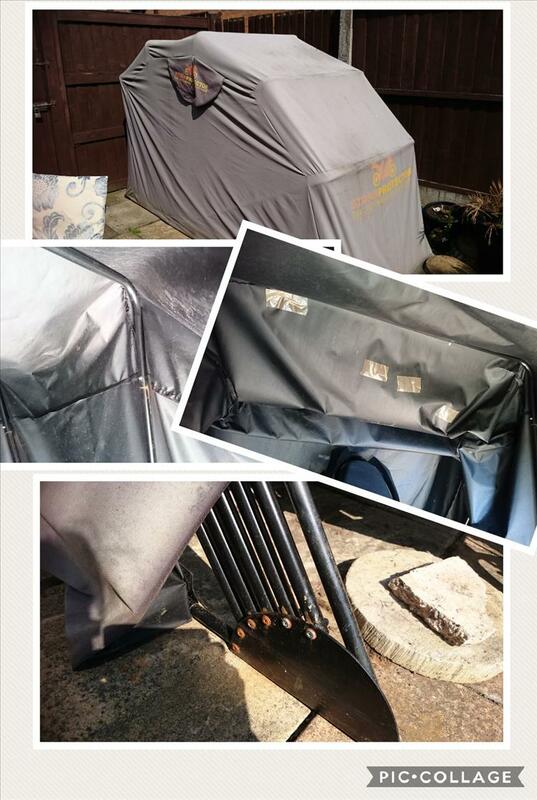 100% Waterproof cover made from 300D coated polyester with PVC coating (heavier, stronger, more robust version material used in modern tents and gazebos, design to be lightweight, durable and super strong). Designed to protect against Ultraviolet light, dust and debris. Fully ventilated sides with Velcro covers side vents for improved air circulation. I purchased my shelter from Ebay and it arrived very quickly. The instructions on how to build the shelter were fairly straight forward and the task was completed by myself and my daughter. The shelter fitted neatly into the spare corner of my garden and the Keeway fitted neatly into the shelter. Happy days. So 9 months on has the StormProtector Motorcycle Shelter provided a good home for my little Zen? Well yes, sort off. However it is not perfect and neither has it matched up to all of its claims. The shelter cover fades quickly from black to grey. Now I only listed this is a negative because this fading may upset some people. I am not happy it has faded but it does not overly concern me as it does not actually effect the function of the shelter. Fade to black ...no fades to grey. The shelter has withstood some pretty hefty winds and survived. Even more remarkable because being a lazy girl I and not having the right tools I never actually got around to bolting it to the floor. 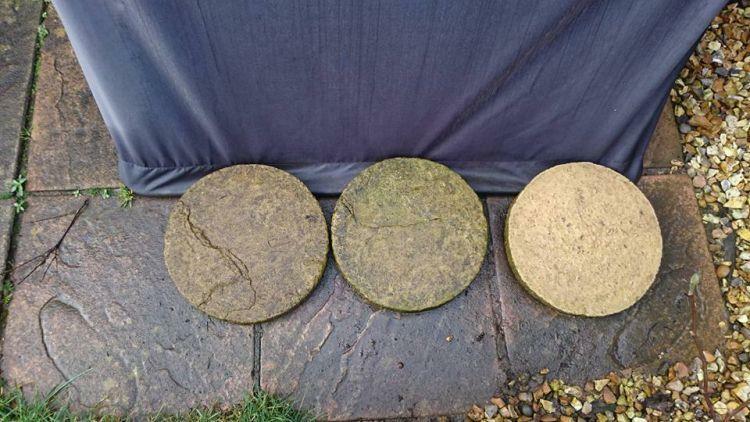 Instead I used a makeshift and do approach with weighing it down with some spare patio flags I had lying around. I laid the flags onto the frame on the inside of the shelter and also once I pull the shelter over the bike I put them on top of the cover. So far so good and that has impressed me. If you haven't got the right tools for the job a make do approach may serve you well. The frame has lived up to claims and so far has not rusted. Most importantly the shelter does work. The shelter folds open and closes with ease even after 9 months. I do not claim to use it everyday however but most weekends at least it is opening and closing. It keeps the bike as dry as you can expect. By that I mean that any bike in any shelter or shed other than a nice heated garage will never be 100% dry. Depending on the amount of moisture in the air itself, the temperature and any condensation a light film of dampness can cover the motorcycle at times. The same things happens to the Kawasaki in the metal shed. I did learn that keeping the ventilation flaps open has helped to reduce the condensation by keeping the air flowing through the shelter. So I would recommend that you keep the ventilation flaps open. The day of this blog it is a average wet day with a temperature of around 8 degrees. I pull the cover back to reveal a perfectly dry bike underneath. Zen may not be warm and cosy in his little shelter but he is at least dry on a wet day. 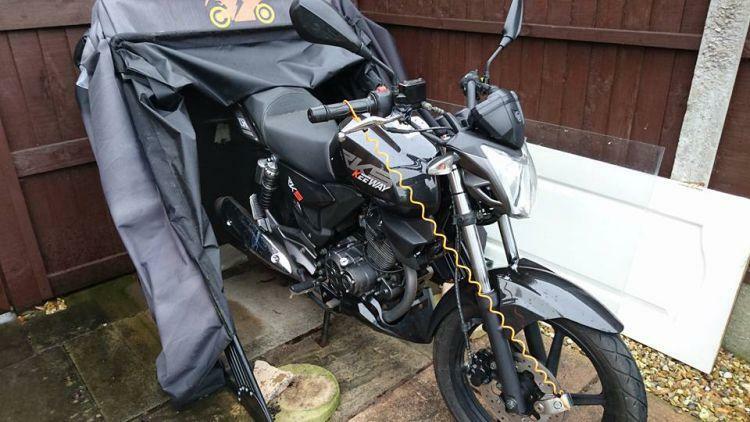 So would I recommended the StormProtector Motorcycle shelter. Well errr the thing is even though it does it job and performs it as well as you can expect a shelter of this type to do, I do not love it. I am not sure how long it may last. I have no reason to think it may not last for years as I have no evidence either way. I just "feel" it wont but I may be proved wrong. The problem is I want a warm dry cosy garage for my bikes to be tucked up in so of course anything else feels a let down. If I do not have a warm cosy garage then the metal shed I do have is my second choice. I think I would like a bigger one that could home both bikes ..one day if I ever get a pay rise. Seeing I have had a 1% pay rise in 5 years I am not holding out much hope. So forget about warm cosy garages and metal sheds I can not afford. As a shelter I could afford then yes I would recommend this product. It is in my opinion a much better option that a simple pull over plastic cover and far more durable. The pooling on the top does get on my nerves but so far it had not caused the cover to leak. It is not the perfect home for my bike but it is is a perfectly good budget solution. Where does your bike live? Have you got a review of your cover or even a recoomendation for a shed? What about security? We'd love to publish your review or your sage wisdom on this subject. Click Here. This might be what my partner and I need to keep our GSX600 in better condition. How hard was it to put together Sharon? The shelter comes with easy to follow illustrated instructions. Basically it is just a case of putting the poles together to make the frame. Only 2 poles require any screws, just 2 screws each so you only have a total of 4 screws to build the shelter. The other poles just snap together. You then simply pull on the canvas cover over the frame and fasten it to the frame via the attached Velcro. Me and my daughter found it very quick and simple to put together. Thank you Sharon. I'm sure we will manage to put it together too. I am not to sure about replacement covers. If memory serves I think I read somewhere when I bought mine that they were available but I have looked quickly on the Internet and not found anything available. I am currently away but will investigate further when home and will let you know if I find any further information for you. I think that you have now had your StormProtector for two years and would like to know how it is standing up to the test of time. I am shortly moving in with my son and will need something like this to keep my 250 Suzuki in. I know you are busy at the moment, and hope everything is going OK with your daughter. Please let me know if and when you can, or if anyone else has had a StormProtector for a few years it would be good to hear your views. I'm sure Sharon will chip in but here's my tuppence. It pools on the top. It's starting to get a little rusty. It has totally faded. In the deepest darkest winter the bike gets condensation on it. Other than covering the bike it offers no security. It's easy to use. It keeps the worst of the weather off. Unless you have a heated garage all bikes have to endure condensation in winter. A regular lick of paint will keep the rust at bay. If you can afford and have space for a shed, get a shed. If you don't or can't then I think these are a better idea than the sheet type covers. Yeah, snot bad even after 2 years. As usual Ren beat me to my reply. I have attached some pictures I took today so you can see what it looks like after two years. As Ren said and as you can see it is certainly not black anymore but that does not effect it's performance. The pool on the top annoys me but again it doesn't seem to do actual harm because it has never began to leak underneath the pool. Mine has a few small holes in it which is caused by my own cat who likes to claw herself up onto my shelter to get on and off my fence. I have just put some parcel tape on those and no leaks there now either. The frame is still in general in good condition. On wet days you can now see a rust tinge to water running out of the frame but all movement when lifting the shelter is still totally smooth. It has withstood some pretty awful weather in the years I have had it so far including several storms and high winds. It was still standing when storm Doris managed to rip my gates locks off. So for the price yes I would recommend it. It is beginning to show signs of wear but I reakon it's still got life in it yet. It looks like it does what it is intended for, it was never going to be a shed. I will look closer at the StormProtector as an option.